ROME, Italy - CNN - There was a double defeat for Manchester United in the Eternal City. Not only did the players metaphorically fail to show up but their fans were literally out sung by Barcelona's noisy, colorful contingent of fans. Barcelona fans proudly display their club colors in Rome. One of the great myths of British football was shattered. English fans do not always travel in greater numbers and chant louder than supporters following other sides in Europe. The red and blue kit of Barcelona was the color of the day around Rome on Wednesday and many Manchester United supporters told me they were surprised to be seemingly in the minority. It is impossible to collect exact figures but reports that Barca returned 7000 tickets from their official allocation seem hard to believe judging from the view inside the Stadio Olimpico. English fans pride themselves on their witty (and, lets be honest, plain rude) songs but you can not fail to be impressed by the communal "technique" of Barcelona's support – scarves are twirled in unison above heads, producing a vast, rapidly moving, wall of color. And because they favor shrill whistling to singing or shouting they are louder than many of their rivals. In fairness to the United faithful, their team did not offer a great deal to cheer about come the time of asking. The English did claim victory on one front, though. While Barcelona fans wandered around Rome bemoaning the lack of beer, United's cunning supporters defied the alcohol ban and, with the help of some compliant bar owners, became champion drinkers for the day – even if their team gave away their Champions of Europe crown at the end of it. It's Manchester United what do you expect. Old Trafford sounds like a morgue on many match days, Keane said it himself, they are the Prawn Sandwiches type of supporters. When any other Club or England are involved internationally, then you will soon hear the supporters, you'll hear them before you see them that's fore sure. I think United need to suffer a few years of not winning anything, and hard times then they will appreciate the good times when they come around. They expect too much now. When Celtic played in the Uefa final a few years ago they had 80,000 fans in Lisbon. Rangers had 200,000 in Manchester for their Uefa cup final. The Uefa cup is a diddy cup compared to the Champions League so I was surprised only 30,000 man utd fans went to Rome. I thought they had the largest number of supporters in the world. Aye right, most man utd fans are just glory hunters. Well done Barca. Every team should expext a bad day, so it was with Man U yesterday. True, they were not at their best and it never looked like a final match. Honestly think the Barca fans and players wanted it more than United. United wore their team jersey so did Barca but Barca brought their passion on and off the field. Congrats to Pep and his boys. I am a proud Barca fan today. One lesson learnt by Man U is that talk is cheap. They made all the noise in the papers around the world as if they have already won. Out-sing,,this is total anhilation of an over-hyped Manchaster United. There was no opposing tem yesterday..all the plays came from Barcelona. Football followers now know Barcelona is in a different class to all English premier league clubs...and Messi at the end of the day is in a different class to Ronaldo despite the over-hype the media created. Man United Fans were not only out-sang, but their team was also out-played and Out-classed. I hope they are able to rise to the pinnacle again after this footballing lesson by barcelona. Now we know who the real babies are (apologies to arsenal). Man U should accept that Barca were better off on the field in Europe, this show Man U players were the boys while Barca players were the men. In the spirit of good sportmanship I say well done Barca! and man u, there's always a next time. The fact is that Barça is nowadays the best team in the whole world and the football they pplay is recognize around it. VISCA EL BARÇA i LA MARE QUE EL VA PARIR. I'm so happy for bacar, coach pep did a good work for using messi's midfield skills,puyol was somthing else too, he does know his players strenght and skills. Barcelona deserved the victory yesterday not only due to the fantastic football played but also due to their fantastics fans. You'd notice that Mediterranean teams have by far the loudest fans in Europe and I wonder why Manchester was suspected to outroar anyone- watch a match of Olympiakos, Paok, Red Star Belgrade or Fenerbache and you'de get the idea of what is really loud, despite the aformentionned teams lower caliber. I recall Olympiakos playing against Liverpool a couple of years ago in Anfield. The red&whites were by far outnumbered by the reds yet you could only hear the greeks. Same in the Bernabeu. Actualy to me several english stadiums sound like a cemetery in contrast to the continuous sonic boom delivered by warm tempered, hot headed southerners. Yes, Man Utd did not give much to shout about but thats what being a fan is all about: supporting your team even if they are losing! We should not forget Liverpool fans singing at half time together, even when they were 3-0 down. Come on everybody, Man U lost and ....? It was good for Messi. So it was for Guardiola, and for Eto'o who caused it all by stoping the early fun of Man U fans. Honestly, it was good for Barcelona as a team and their fans all over the world, particularly my physician that ignored my heart by predicting Barcelona's victory. Oh!.... ! Good for soccer and the game for remaining so unpredictable. What happened was typical. That's the beauty of the game. Man U did not know how it happened. It just happened. Let the manager and the players remember that it is the way of the game. Man U will rise again. Congratulations Barca! I think Barca owned Man U because the Reds were overconfident. mainly because Barca didn't have three first choice defenders. I´m afraid your making some gross generalisations about Man Utd, English fans and even the Barcelona support.
" 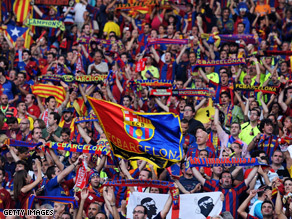 you can not fail to be impressed by the communal “technique” of Barcelona’s support – scarves are twirled in unison above heads, producing a vast, rapidly moving, wall of color" Yes, very impressive but started by English fans in the 1970s. By the way, Man U never have been big singers, very weak on t hat front and I can only imagine a lot of the true working class fans were priced out of going to Rome. I take it your a NFL fan, maybe basketball or is it that so every so exciting game of baseball, fans go wild there eh!. You wanna here noise just come to Millwall. Often forgotten – Barca have the highest average attendance of any club in Europe (helped by the Camp Nou having a capacity of over 98,000). That their fans are noisy and passionate should not be a surprise to anyone, apart from those people who stayed cocooned in the myths surrounding the English Premier League. Man U lost because they fail to learn how to play Barca from Chelsea. Well next season is another time. Well, fair enough! You win some, you loose some... You know, loose the Euro cup, win the drinking match.